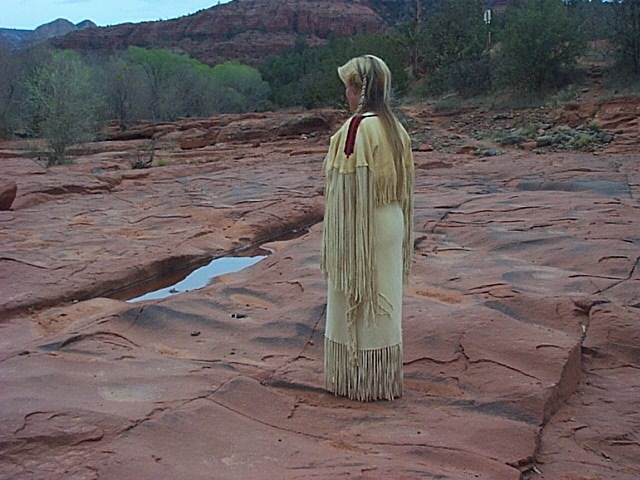 THESE DRESSES ARE MADE READY FOR BEADING WITH YOUR OWN BEADWORK OR YOUR CHOICE..
All hand cut lace, hand sewn, hand tied fringe on the skirt. THIS DRESS IS READY FOR BEADING WITH YOUR OWN BEADWORK. All hand cut lace, hand sewn, hand tied fringe on the skirt. 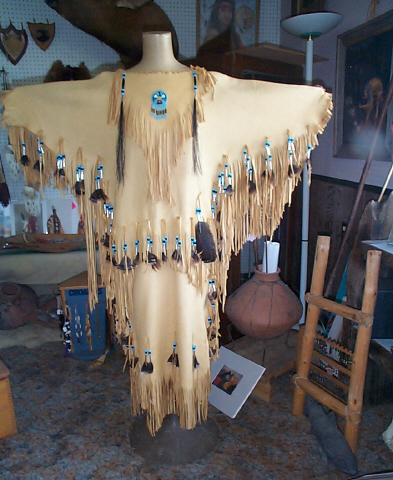 For Pow Wow dancing or wedding. Dresses made to your size. Price esimate upon request. There are a lot of pictures on the next 12 pages, so please be patient. Some pages may take longer to load if you're running off of a dial-up connection. Prices are no longer listed as the price for each dress will vary depending on size, and hide costs at the time of purchase. Please e-mail me if you have any questions regarding pricing.